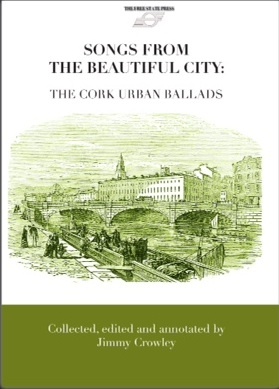 Songs from the Beautiful City: The Cork Urban Ballads is at once an ethnography and an autobiography. It proclaims the true history of the people of Cork City through their only resource of expression: the humble ballad. It is also the story of Jimmy Crowley’s own long-standing romance with Cork ballads. The songs have arranged in generic chapters like: The Sporting Muse: The Sound of History; Comic Songs, Children’s Songs, Portraits (of much-loved Cork people), Emigration, Political, Didactic and Nationalist Songs, etc. This unique collection includes music notation to all songs as well as associated photographs with an extended, engaging preamble loosely based on his long-running weekly ballad column on the Cork Evening Echo. All prices will include shipping and handling. *The book also includes a “balladcard” which gives access to the air of each song.